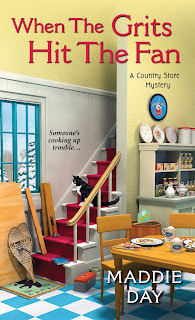 Robbie Jordan here, from Maddie Day/Edith Maxwell's Country Store Mysteries. I'm so excited that my third adventure will be out at the end of this month You can preorder When the Grits Hit the Fan wherever books are sold!. If you've read the earlier books, you know my single mom was a cabinetmaker who taught me the basics of carpentry. So when I bought the run-down country store in southern Indiana (where my mom was from), I did most of the renovations herself to transform the downstairs into my breakfast and lunch restaurant, Pans ‘N Pancakes. But I've always planned to develop the unused second floor into a few bed and breakfast rooms, and I'm doing just that in book three, When the Grits Hit the Fan. It’s winter, the restaurant business is a bit quiet, and I have time to tear out walls upstairs. like it was from the thirties or forties, as well as the carpenter’s signature and date on the back of a piece of window trim. Funny how those same shoes appeared in the walls of my building in South Lick, too. But it was when I found not only a secret passageway but an old diary in the wall that thing really got interesting - and a bit dangerous, too! I hope you enjoy the read. Readers: Have you ever lived through a home renovation? Discovered curious items in walls or at yard sales or vintage shows? 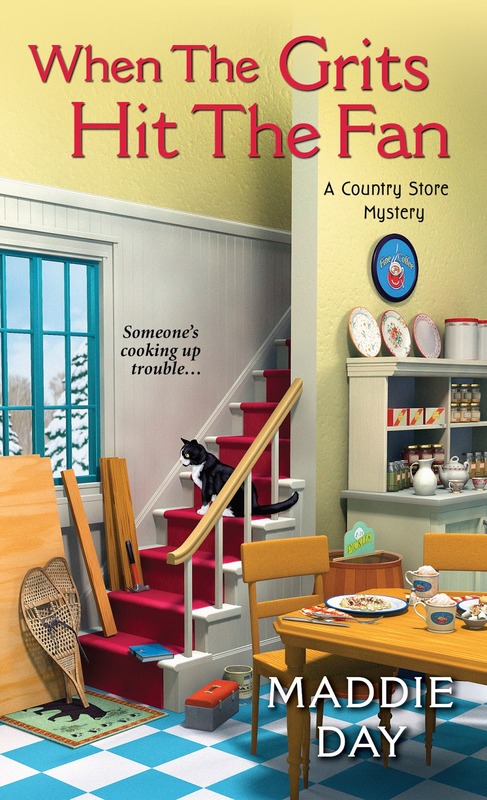 Edith Maxwell writes the Quaker Midwife Mysteries (with Delivering the Truth nominated for an Agatha Award for Best Historical Mystery) and the Local Foods Mysteries; the Country Store Mysteries and the Cozy Capers Book Group Mysteries (as Maddie Day); and award-winning, Agatha-nominated short crime fiction. Home renovation never ends (sez she, slogging through her second Victorian). The oddest thing the current house has produced was a single stereopticon image (you know, the ones that are sort of binocular?) 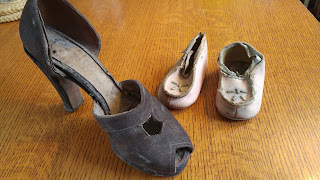 probably before 1900, found under the attic floorboards. It shows a woman looming over a man--who is doing laundry. A feminist message from the past? While renovating our 1940's farmhouse which was mostly built from materials that came from a house built in the 1800s that was being torn down, we have found some peculiar items. The first was when we pulled down the ceiling in a downstairs bedroom and a pair of men's underwear came falling down. The second was when we pulled up the linoleum in the kitchen to find old newspapers, coins, buttons and a screwdriver. The foundation is next and who knows what's buried under this house? In another life, I lived in a home that was about 150 years old and we needed to update some things for our family. We did not find anything in the walls, but we did find that in the sun room - windows on 3 sides - not one window was the same distance from the floor or the ceiling - and the 3 doors were all different distances from the ceiling. But, that house had the most wonderful atmosphere and feeling of warmth. We have never renovated; we rented most of our marriage because coaches in Texas seldom stay in one spot for long. I leave my exciting find to the pages of wonderful books like When the Grit Hits the Fan. Absolutely loved it. The characters are amazing and the plot is so intriguing! No, I haven't. I always look at the old photos people leave in frames at sales, and wonder about their stories. I've done that. A while back I bought a single photo of a pair of kids, who clearly didn't want their picture taken. Their first names were written on the back, but no more. But the photographer was in Arizona, and I think there was a date on the picture--which luckily was shortly after they started recording censuses there. There were so few people listed then that I could identify the children based on their first names alone. BTW,I bought the picture because the girl (the older child) was such a tomboy--no way was she going to dress up for the picture.